This is an unusual and beautiful cats-eye tourmaline, 2 oz and 1.6” by 1.2” by 1.1” and is a new arrival from Brazil. And I am in love! 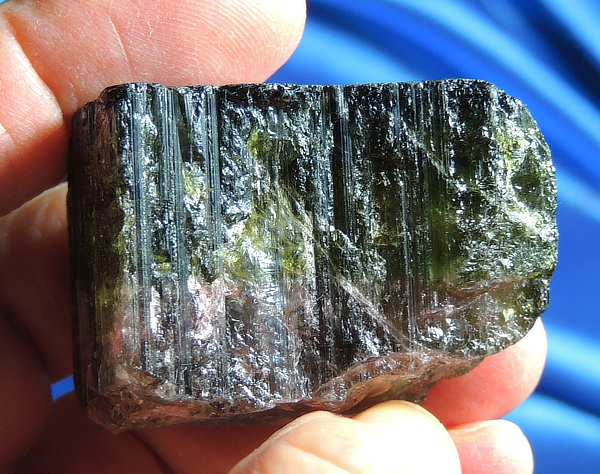 Pictures do not do her justice – she is chatoyant and unless the light catches her chatoyancy, you think she is merely a dark green tourmaline. But with that light, her rich colors come alive and show pink, green and a touch of yellow! Her base and side contact area are healed and her termination shows a number of nice record keepers – this is unusual in a tourmaline! She has loving and gentle energies that her Keeper will treasure!